MICHAEL FOX: This Worker’s Day in Brazil was like no other. Thousands traveled from across the country to the city of Curitiba, in southern Brazil. They came in caravans of buses, riding overnight, or even for several days. 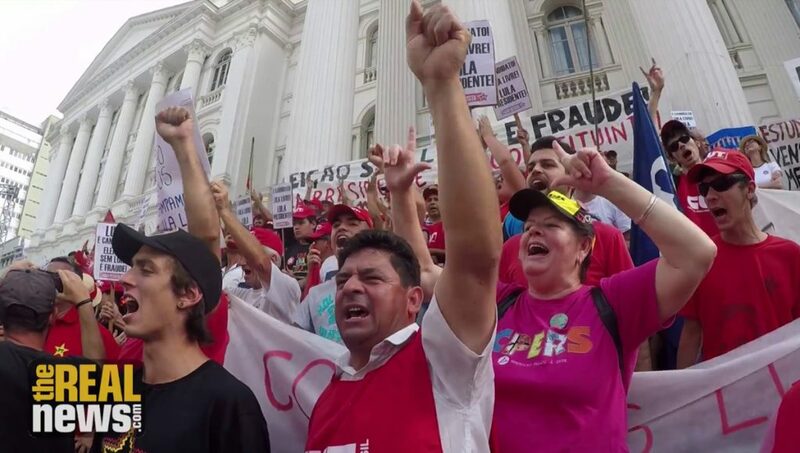 This is the first time all seven of Brazil’s major trade union federations have united for Worker’s Day since the fall of the country’s military dictatorship in 1985. SPEAKER: This May 1st is historic because it not only unites the trade union federations, but also the social movement fronts. The popular Brazil Front and The People Without Fear Front in working class unity, never before seen in our country. MICHAEL FOX: They’re united behind one common goal: freeing Lula. For the last month, former President Luis Ignacio Lula da Silva has been serving time in this federal prison in Curitiba. In a controversial trial, judges convicted him of corruption for allegedly accepting a beachside apartment from a company seeking government contracts. He was sentenced to 12 years. But Lula and Brazilian workers say he’s innocent. They believe his imprisonment is just a ruse to knock him out of the running for this year’s presidential elections. Despite prison, Lula is still well ahead in the polls. Eliana Rocha traveled by bus from Rio de Janeiro with dozens of companions. ELIANA ROCHA: I’m here against this absurd decision, by those behind the coup, to jail the country’s most important leader. He’s innocent. That’s why everyone is here, to say that his imprisonment is unjust. MICHAEL FOX: Since Lula’s jailing, hundreds have participated in an around-the-clock vigil just down the street from where he’s being held. With supporters from around the country, the crowd swelled on Worker’s Day into the thousands. Workers have taken a beating under President Michel Temer, who rose to power after the impeachment of Lula’s successor, Dilma Rousseff. Last year, Congress passed a new labor reform, gutting workers’ rights and opening the door to sidestep unions. Lula, they hope, could turn the tide. JOSÉ JORGE MAGGIO: Right now, we can see, that the coup was not just against Dilma Rousseff. It was against the workers. It was a terrible coup, and it united the working class, in defense of Lula, to undo this reality, which is disastrous for the working class. VAGNER FREITAS: Saying, “Free Lula,” that he’s innocent, that he’s our president, is the greatest tool that we have to get our rights back. MICHAEL FOX: On stage, union leaders stood side by side. Lula’s imprisonment has, paradoxically, united the country’s left in a way that has not been seen in decades. Unions, social movements, leftist parties. At stake, they say, is nothing less than the fate of Brazilian democracy. GUILHERME BOULOS: This May 1st is for workers’ rights, for the workers’ struggle. But is is also for the democratic struggle in our country, a democracy that is being wounded every day. MICHAEL FOX: Under the Temer government, the country has also seen a dramatic rise of the right, hate groups, and violence. The pro-Lula camp in Curitiba was attacked by a gunman less than a week ago. Two people were injured, one of them hospitalized. The bullets were found to come from police stocks, just like those used in the assassination of Marielle Franco, the black LGBT councilwoman from Rio whose killing sparked international outrage in March. Calls for justice for both Marielle and Lula rang out from the stage. OLIVIA SANTANA: They killed Marielle, and they jailed Lula. But we are here to say that Marielle lives! She lives on in us! Long live Marielle! Free Lula! Long live democracy. The struggle continues. MICHAEL FOX: The months leading up to the October election will likely define Brazil for the coming years. If Lula is allowed to run, it will only be because of the unity and organizing happening today in Curitiba and across the country.